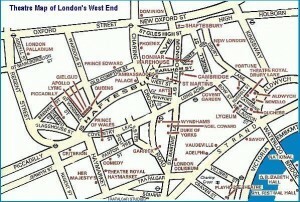 As you can see, the main theatres in London (all apart from the Victoria Palace and the Apollo Victoria in Victoria) are all centralised around Covent Garden, Leicester Square, Piccadilly Circus, and Soho. 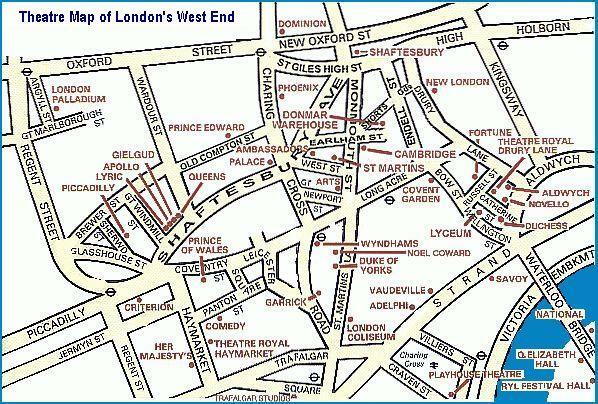 If you have a hotel in this area then there is really no need to ever hop into a cab or use the London Underground (unless it is really raining. This area is also perfectly accessible from any of the neighbouring areas of Mayfair, Marylebone, Fitzrovia, Bloomsbury, Southbank, Westminster and the afore mentioned Victoria. Only when you get out to Bayswater or Kensington or the City is it probably not a great idea to walk – especially in your evening finery and killer heels! As you can see Theatreland is served by 8 tube stations – Oxford Street, Tottenham Court Road, Piccadilly Circus, Leicester Square, Covent Garden, Holborn and Charing Cross and the afore mentioned Victoria. For the theatres down by the river and on the Southbank you can also use Embankment.